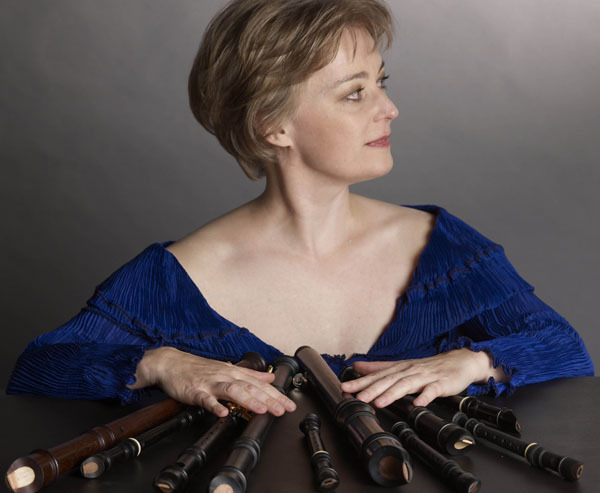 Michala Petri has performed more than 4000 concerts in the worlds leading festivals and Concert Halls,and has broken down the boundaries of her instrument, the recorder. Since her youth, she has followed her wish for musical expansion in various ways, through commissioning more than 150 new works, through dialogue with other musical cultures and through developing new playing techniques. Artists with whom she has collaborated include Keith Jarrett, Sir Neville Marriner, James Galway, Gidon Kremer, Heinz Holliger, Henryk Szeryng, Pinchas Zukermann, Maurice Andre, Joshua Bell, Mahan Esfahani and Claudio Abbado. Among composers having composed for her are Sir Malcolm Arnold, Gordon Jacob, Per Nørgaard, Vagn Holmboe, Pelle Gudmundsen-Holmgreen, Olav Anton Thommessen, Sunleif Rasmussen, Bent Sørensen, Steven Stucky, Joan Albert Amargos, Chen Yi, Bright Cheng, Ander and Thomas Koppel and Daniel Børtz. She has received the Leonie Sonning Music Prize, Europa Musicale Soloist Prize, three times the German ECHO KLASSIK Award, amongst others. She has recorded more than 70 cds, several having been Grammy-nominated. Her repertoire spans works from the Baroque, Classicism, Romanticism and extends into contemporary and improvised music. It is precisely this versatility that lies behind her special appeal as an artist. A daughter of a violinist and a pianist, both with interest in contemporary music, she already as a child became interested in expanding the possibilities of her own instrument, to make it match the sounds she grew up hearing. She started her formal education at age 11 at Staatliche Hochschule für Musik und Theater in Hannover, Germany, with Professor Ferdinand Conrad. At the time of her studies the recorder was mainly considered only an instrument for baroque music, but already then many of today's composers were composing works for her. The first work dedicated to her was from Danish Fluxus artist Henning Christiansen: "To play for a child. Through the demands she met from new compositions, she further developed various playing techniques, enabling the recorder to have a more varied tone-quality and a larger expression. In spite of advice to take on a "real" instrument she stayed with the recorder - realizing the instruments ability to immediately express the players intentions, being the wind instrument reacting most instantly to the breath of the player. Furthermore she saw a challenge in advocating that good music making is independent of advanced remedies, and in "demystifying" classical concerts, realizing that many people unfamiliar with classical and modern music would be attending her concerts, being familiar with the instrument. Since youth she has made a point of programming contemporary music in her concerts challenging the audience, and advocating that modern music is as accessible as old, if put i the right frame and if performed in an atmosphere of bonding with the audience. In her wish to extending the instruments limited dynamic potential she has actively collaborated with instrument-makers, and applied her experience to the development of a new type that incorporates her ideas. "With this instrument, which has more dynamics and compass, I can give better expression to the music, with more freedom and naturalness in my expressive range". From the beginning of her career she has performed with musicians outside the baroque music scene, such as Palle Mikkelborg, Keith Jarrett, Carsten Dahl, Jesper Thilo, Niels Jørgen Steen, Benjamin Koppel and Bjørn Svin. Her collaboration in the 90s on two cds with Keith Jarrett, gave her a latent interest in the art of improvisation, which is partly required in Baroque music, though within the narrow borders of the rules of that time. The collaboration was initiated by Keith Jarrett, who heard Michala play in concert at New Yorks Lincoln Centre and suggested that they at some point played something together - which let to two albums of Bach Sonatas and Handel Sonatas. Recently she has taken up playing fully improvised concerts, amongst others with Benjamin Koppel and Carsten Dahl. Her recording production counts more than 70 cds. A concert at BBC London when she was 17 let to her first Album for Philips/Polygram in London with Academy of St. Martin-in-the-Fields, followed by an exclusive contract with the company, until years later she signed an equally long term contract with the international RCA/BMG (New York). In 2007 she formed with her yearlong music partner and former husband Lars Hannibal her own recording company, in order to do more contemporary and experimental albums. Their first release, "Movements" with three contemporary concertos received a US Grammy nomination in the cathegory "Best contemporary Composition" for the work "Northern Concerto" for recorder and large orchestra by Spanish jazz/classical composer Joan Albert Amargos. A series with contemporary concertos for recorder and orchestra has been started; the releases so far are Chinese Recorder Concertos (Grammy nominated), English Recorder Concertos, Danish/Faroese Recorder concertos and with German/French Recorder Concertos,- released May 2016. American Recorder Concertos, Pacific Recorder Concertos and South American Recorder Concertos to follow. Since 2014 Michala played in a Duo with Harpsichordist Mahan Esfahani,- and they relesed so far on OUR Recordings "La Follia" with Music by Corelli (ICMA Award 2016 as "Best Baroque Instrumental" and UK-DK with Modern Music from England and Denmark. Other ways of expanding her musical horizon and borders of her instrument has been to search dialogue with other genres and cultures. With composer/trumpetplayer Palle Mikkelborg the "cross-over" she has made the World music album "Going to Pieces - without falling Apart" for recorder, harp and strings. The album "Dialogue - East meets West" is an album investigating the meeting of two cultures - Western and Chinese - in a form as simple as possible: Five Chinese and five Danish composers were each asked to write a duet for recorder and the Chinese "xiao/dizi" - performed by leading xiao player Chen Yue. The two cultures are opposite and therefore complementing each other - and at the same time they meet at a the musical level where all are united. The combination recorder/choir caught Michalas enthusiasm after premiering a piece in 2008 by Daniel Børtz with the Swedish Chamber Choir. Soon other works followed by Sunleif Rasmussen and Peter Bruun, swell as the already classic piece "The Nightingale" by Latvian Uģis Prauliņš. The works are recorded on the CD "The Nightingale", which was Grammy nominated twice and received an ECHO KLASSIK Award. Album Prizes: Echo Klassik (Deutsche Schallplattenpreis) 1997, 2002, 2012 and 2015. Danish Music Award (P2-Prisen) 2006 and DMA nomination 2013 . Nomination for US-Grammy: 2008, 2011, 2012 and FMA (Faroese Music Award) 2016. Since September 2012 Michala Petri serves as Honorary Professor at the Royal Danish Academy of Music,- and since 2014 as vice- president at Recorder Society UK..